The 1st of October marks the founding in 1949 of the People’s Republic of China. Addressing a mass rally in the heart of Beijing on that day, the Chairman of the Chinese Communist Party Mao Zedong announced the establishment of a Central People’s Government. A decades’ long aspiration for national independence and unity seemed certain to be fulfilled. After years of civil strife, war, invasion, economic depredation and social chaos, countless people were swept up in a mood of celebration hoping for a brighter future. Exhausted by years of conflict their elation was in part the result of that fact that, in the lead up to 1 October 1949, the Communists had made numerous undertakings to vouchsafe the dawn of an era of true democracy, freedom of speech and basic human rights. The promises were reported in the Party media for nearly a decade from the early 1940s; they are collected in Voices of History: solemn promises made half a century ago 歷史的先聲——半個世紀前的莊嚴承諾, a handy volume published on the eve of the 1st October National Day in 1999. During the 1950s, the guarantees of the 1940s were soon betrayed; they have never been fulfilled. Voices of History was hastily banned in early 2000. Today, the Xi Jinping era (2012-), in continued breach with that long-forgotten past, trumpets the Communist Party’s march along what it calls The China Road 中國道路. In 2017, China’s National Day marks the start of an eight-day holiday encompassing not only the symbolism of the old Maoist party-state on 1 October, but also the folk traditions of the Mid Autumn Festival, celebrated this year on the 4th of October. 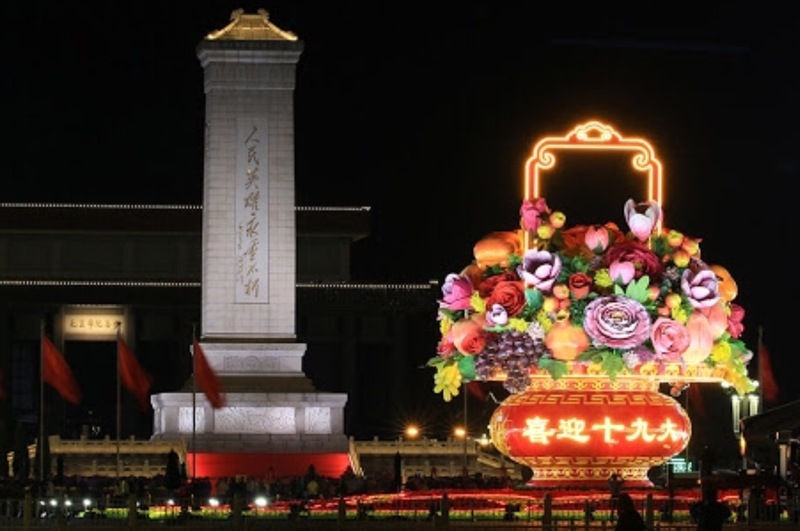 Tiananmen Square on the eve of the 1st of October 2017 celebration of National Day, Mid Autumn Festival and the Nineteenth Congress of the Chinese Communist Party. Mid Autumn, marked by the full moon of the eighth lunar month, is also known as Reunion Festival 團圓節, traditionally a time when daughters would visit their birth families and unity was marked not only by a full harvest moon, but in foodstuffs and customs that featured harmony at home. The 2017 eight-day National Day-Mid Autumn holiday is hailed by Chinese businesses as a ‘Super Golden Week’ 超級黃金周. It is estimated that 7.1 billion tourists will be on the move, both in China and to Japan and Thailand, the most popular overseas holiday destinations. For many people in Hong Kong, that alienated Chinese territory, the double commemoration of National Day and Mid Autumn Festival is a sombre one. Today, 1 October, we acknowledge that disquiet by launching a new series titled ‘Hong Kong, The Best China’ 香港，最好的中國. The series title was suggested by a remark made by John Minford in an interview given to the Hong Kong Economic Journal 信報 in April 2016: when John’s mother entertained guests, she would make a point of bringing out ‘the best China’. An effort was necessary, John went on to observe, to preserve ‘the best China’, much of which can be found in Hong Kong. Our Hong Kong-related Heritage Journal entries will feature in our Heritage Projects incorporating previously published materials, that is essays, satires, poems and comments that have appeared from 1 July 2017, the twentieth anniversary of Beijing’s take over of the former British crown territory. In this first instalment of ‘Hong Kong, The Best China’, we introduce recent commentaries by the veteran journalist Lee Yee 李怡 (李秉堯). Founding editor of The Seventies Monthly 七十年代月刊 (later renamed The Nineties Monthly) Lee Yee has been a prominent commentator on Chinese, Hong Kong and Taiwan politics for over forty-five years. His position has gone from that of being a sympathetic interlocutor with the People’s Republic in the late 1970s to that of outspoken rebel and man of conscience from the early 1980s. For decades Lee has analysed Hong Kong politics and society with a clarity of vision, and in a clarion voice, rare among the territory’s writers. The following essays are translated from ‘Ways of the World’ 世道人生, the regular column Lee Yee writes for Apple Daily 蘋果日報. Lee Yee is also one of The Ancestors of China Heritage. He was both a mentor and my first employer (notwithstanding summer jobs for the National Roads and Motorists’ Association (NRMA) and for Gunz Pty Ltd, my father’s company, during my teens). I first met Lao Lee when passing through Hong Kong in October 1974 on my way to study in the People’s Republic. Having reached an educational deadend on the mainland, and becalmed in Shenyang (due to supposed ‘bourgeois anarchistic’ tendencies I had not been allowed to transfer to Nanjing with my classmates), I visited Lee Yee again during the Chinese New Year of 1977. He offered me a job starting later in the year. It is forty years since I began working under his tutelage. 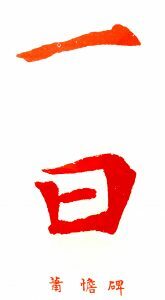 At the time, I was but a callow youth of twenty-three yet, amazingly, he appointed me as one of the English-language editors at The Seventies Monthly which operated out of Cosmos Books Ltd 天地圖書有限公司 on Johnston Road in Wanchai, Hong Kong. Working with Bennett Lee, a Canadian who had also studied in China, I was put to work translating the political analyses of contemporary Chinese politics that Lee Yee published under the name Ch’i Hsin 齊辛. Before working with Lee Yee, I had painstakingly acquired the rudiments of reading (and understanding) the mainland Chinese media both as an undergraduate and during my years as a student in Maoist China. But it was Lao Lee, with his analytical talent and independent mindset, who led me further into appreciating the ‘ways that are dark’ that constitute what I later recognised as New China Newspeak 新華文體. Lao Lee was also one of a number of Hong Kong friends who encouraged me to write in Chinese, and he published my first interview, a conversation with the then recently rehabilitated writer Ding Ling 丁玲. During the 1980s, Lee also invited me to translate occasional columns on the Sino-British negotiations and the Hong Kong Basic Law for the Asian Wall Street Journal (for an example of one of these columns, see below). He was a sceptic then, a Cassandra even. Time, and events, have proven him right. 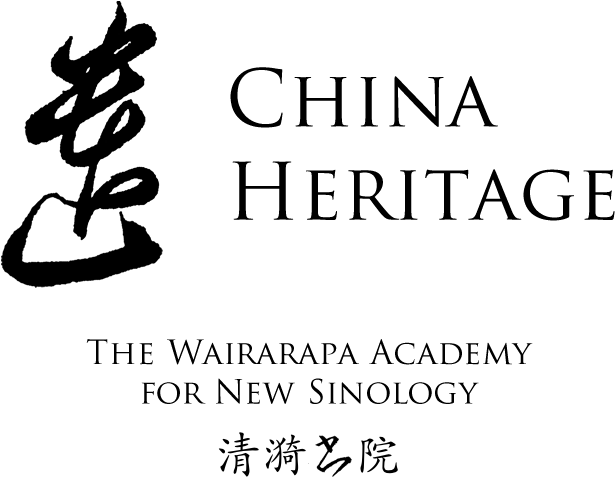 Our thanks to John Minford, co-founder of The Wairarapa Academy for New Sinology, for allowing us to quote from Chapter 17 of his new translation of The Tao and the Power 道德經 (forthcoming with Viking Penguin in 2018). All other translations are mine. On 29 August 2017, the Standing Committee of China’s People’s Congress discussed a further revision of a new law framed to protect the National Anthem, March of the Volunteers 義勇軍進行曲. It was proposed that this law be added to Appendix 3 in Hong Kong’s Basic Law 香港基本法附件三 as early as October 2017. The draft laws would ban people from playing the March of the Volunteers at events such as funerals or as background music in public places, which lawmakers argue reduce the anthem’s dignity. Malicious revisions to the lyrics or derogatory performances may also be punished under the proposed legislation by up to 15 days in detention. As with other mainland Chinese state rituals that have been concocted over the past few decades, there law also contains stipulations regarding the appropriate demeanour to be adopted by Chinese citizens when the national anthem is played. In imitation of American practice, when the anthem is played all loyal Chinese are expected to stand ‘solemnly’ at attention, while athletes and others are required to place their right hand over their heart. Further stipulations in the bill cover education and the promotion of the song. The anthem would henceforth be included in textbooks from primary school onwards; it is to be sung by all and sundry on appropriate occasions to ‘express patriotism’. As Hong Kong democracy activists voiced concerns that these draconian proscriptions were aimed in particular at parodies and protests over the Chinese anthem, it was reported that the well-know Anglophile, socialite, entrepreneur and Financial Times agony aunt columnist David Tang 鄧永鏘 (Sir David Tang Wing-cheung) had died. The political commentator Lee Yee 李怡 chose to overlook Tang’s death and instead devoted two columns in his ‘Ways of the World’ 世道人生 column in Apple Daily to the Chinese anthem. In the first column, Lee pointed out the disingenuous nature of China’s belated efforts to protect a national anthem that had, in the past, been treated with opportunistic contempt. How long, one wonders, before Hong Kong protesters, inspired by NFL players in the United States, ‘take a knee’ when March of the Volunteers is played? 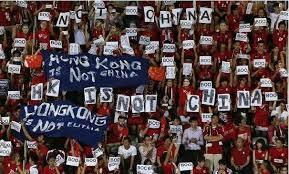 Protests of the kind that threaten the imposition of the new ‘National Anthem Law’ on Hong Kong. 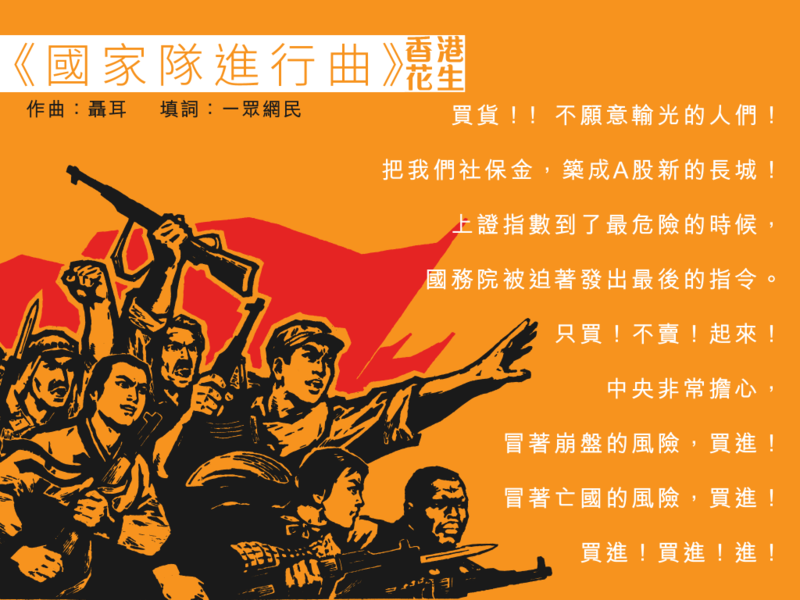 One of the many Hong Kong spoof 惡搞 versions of the Chinese national anthem. Those lower still were feared. The lowest of all were reviled. ‘We Did it Ourselves’ in the hand of Li Jintai 李金泰.